Recombinant funsion protein containing a sequence corresponding to amino acids 1364-1663 of human C3 (NP_000055.2). PBS with 0.02% sodium azide, 50% glycerol, pH 7.3. Store at -20°C. Avoid freeze/thaw cycles. 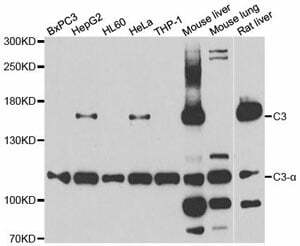 Western blot analysis of extracts of various cell lines, using C3 antibody at 1:1000 dilution. 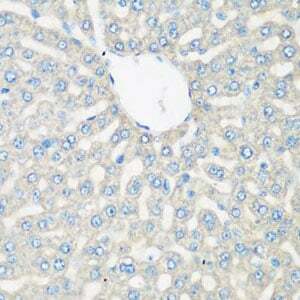 Immunohistochemistry of paraffin-embedded rat liver using C3 antibody at dilution of 1:200 (40x lens). 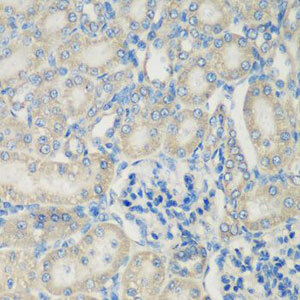 Immunohistochemistry of paraffin-embedded rat kidney using C3 antibody at dilution of 1:200 (40x lens).